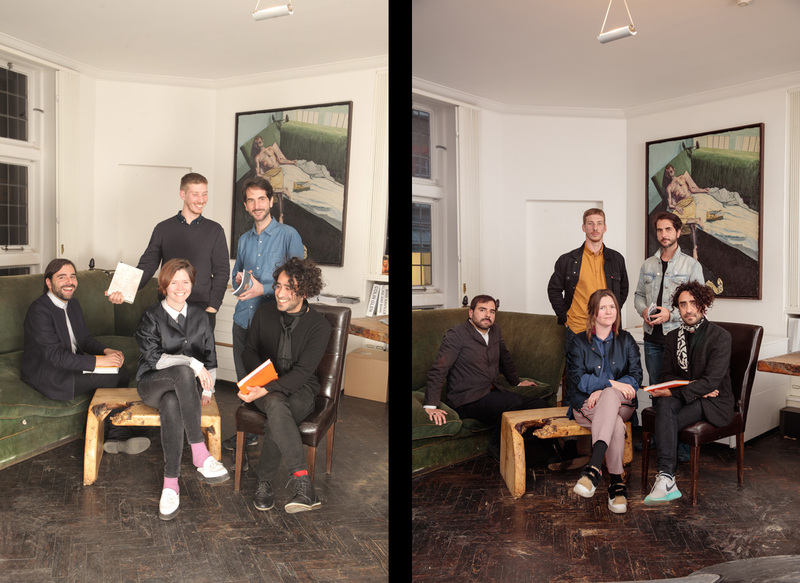 Five indie publishers come together on the same sofa as the one they assembled on in 2015 for the British Journal of Photography [BJP]. They look backward, inward and forward at photography. A group of indie mavericks [curators-publishers-entrepreneurs] is challenging the status quo in the traditional publishing business with creativity, boldness and DIY solutions. 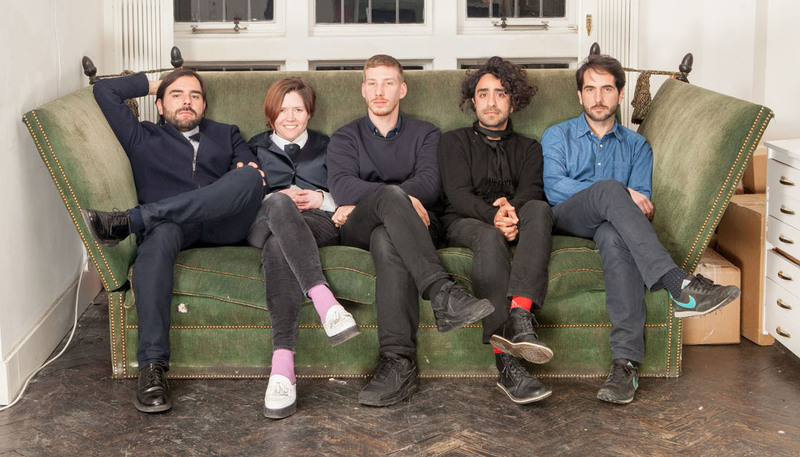 Despite a shortage of cashflow, they experiment with pop up low-fi shows and photo blogs, collecting and curating emerging artists whose entrepreneurial instinct matches their own. In 2015, The British Journal of Photography sits five of them on a green sofa for a memorable photograph with a direct reference to The Clash’s ‘London Calling’. 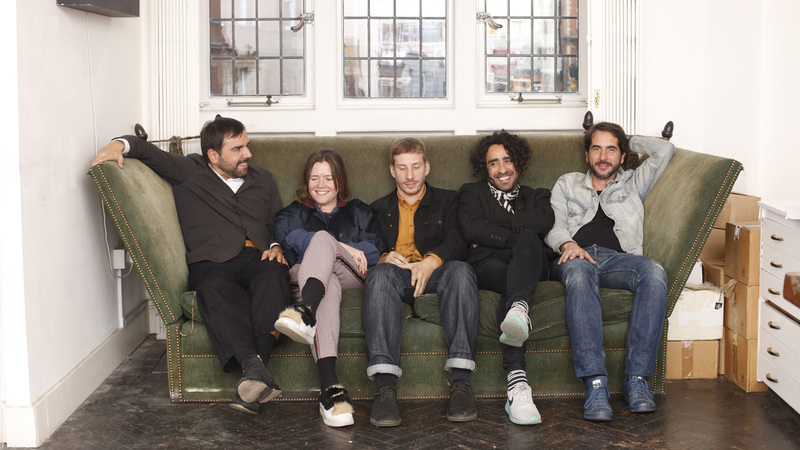 The group look like an indie pop band. They are the masters of the 21st century’s demo tape –– the photobook. Offprint and Simon Baker, then photography curator at the Tate Modern, give them center stage in the Turbine Hall. Bruno Ceschel of SPBH Editions builds a space for workshops, performances, screenings and more in its center, and dresses his ‘Special Agents’ in electric blue boiler suits with a sign saying Play With Me on their back. Aron Mörel hosts a stand with his artists handling the morning sales while he nurses a hangover. On oodee.net, artist-designer Damien Poulain gives female photographers from London, Tokyo, Bogotá, Johannesburg and Beirut, a platform to showcase their work. Hannah Watson builds on Gigi Giannuzzi’s legacy by supporting emerging female artists like Juno Calypso, Haley Morris-Cafiero and sculptor Juliana Cerqueira Leite. And Maxwell Anderson publishes his first book, a love letter called See You Soon. London, Gallery TJ Boulting. British Journal of Photography, 2015. ICP Lab, 2018. Photos © Laura Pannack. The photobook builds its reign playing with the marketing tools tech companies have given away for free to young entrepreneurs. 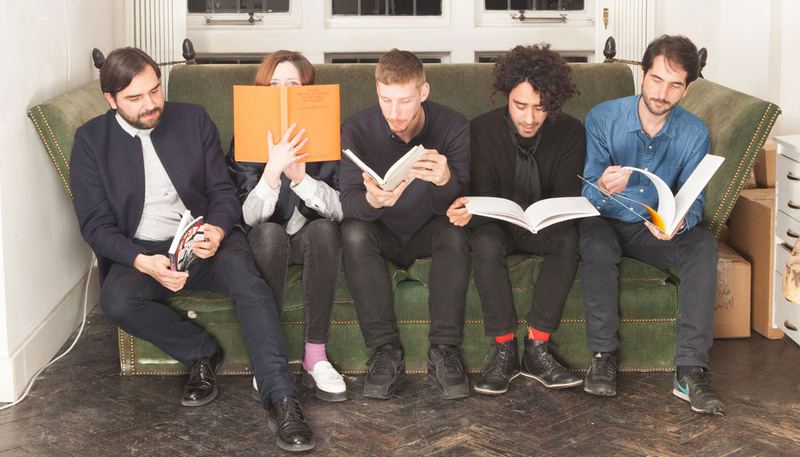 The Art Book fairs are on the rise and become ‘live events’. Lens Culture lists 22 Photo Festivals to visit in 2018. The indie publishers have built their own support system. They hunt up-and coming talent, curate books, publish, market, mentor while constantly entertaining an online and offline network with wit, humour and critical thinking. On their websites, they host an ‘Out of Print’ section as a reminder of how limited editions can become cult collector’s items in a flash of an eye. ‘Sold Out’ special editions escalate in price. But don’t get them started on economics. Cashflow is still an issue. Never mind! ‘Social capital’ is the new gold, their tireless drive sees them being sent limos by Gucci, flown to South Korea or expected in Shanghai. They turn talks into performances at ICP Bowery, NYC, they rule the female artist movement in London’s clubs. If Maxwell is still driving a van, Bruno still teaching and Aron still printing zines, and if Damien is selling illustrations to Louis Vuitton to pay his mortgage, they at least have found a way to cover the rent each month without Silicon Valley’s seed capital. While some cultural institutions and fashion brands are still figuring out how to entertain and retain audiences, while Facebook takes a hit from meddling with ‘news’ and Instagram loses its founders, the indie publishers are instead growing their audiences with a clear sense of being ‘niche’, but ‘flirting with the mainstream’, testing distributors ‘to move stock’, convening workshops, exhibiting at festivals and attending art book fairs. They have infiltrated schools, hijacked institutional space, and refused any form of photography dogma. They will be found where DIY culture merges with UX technology. They are the future ‘curators/conductors’ of polymorphic stages where print arts, digital arts, and live arts merge. Where humans augment reality. Alive and sparkling, they reconvene on Gigi Giannuzzi’s green sofa at TJ Boulting Gallery in London. Aron: When we came of age in the 90s, there was that sort of DIY influence and to certain degrees we all wanted to grab onto it and do our own things instead of work in an office. And that coincided with the music indie labels that came out and a culture that was sort of trying to mingle with mainstream, which I think informed our consciousness, and that merged with technology and blogs coming up and here we could actually build our globally accessible platform. Damien: For me DIY is really the 80s and a result of the economic recession in America and in England which triggered young people to make their own things. I started because of the internet. I was used to Facebook and I saw that you could do it by yourself. So yes, DIY but thanks to internet’s global reach, I would not have done it otherwise. DIY was part of a movement; an attitude. Aron: Yes, the DIY philosophy informed us and suddenly the technology came along to support it in the early 2000s. I started by collecting books and I liked young zines. I was especially fascinated by small poetry publishers who put them out by themselves. Then Fragrant by Faber and Faber won an award, absorbed them and took over, but all these small publishers had done the groundwork and hard work. My first books were tiny poetry books. Also, what fascinated me was the early access of cheap laser printers. I was on tax credits, on housing benefits and bought the first £300 laser printer, and that’s self-publishing. You can scan things and put them out. I still do 99% of things myself. You didn’t need a team, you didn’t need to outsource, that made it super accessible and also there were people like Emeric Glayse and his blog Nofound on Tumblr, and Tim Barber with Tiny Vices. There were all these blogs of young people curating interesting bits of medium and taking hold. And these blogs had identity, they weren’t just content stock hold under Facebook or Instagram. Damien: Yes, that was a particular time, pre-Facebook and Instagram. Aron: Yes, 2004, and that’s also the time where people were doing that stuff intelligently and all of them like Emeric and Tim Barber have evolved running their own stuff. Yes it was people embracing something themselves and once again, it was very niche. So yes that DIY inheritance combined with the technological fusion of the internet and being able to reach audiences in Japan. Damien: Yes it’s that artisan craftsmanship which you use to express yourself and paired with social media, we could reach out to Japan and America. Maxwell: 2010, is when I started. I was working for Chris Boot Ltd, taking over from Bruno [Ceschel], and that’s when I self-published my first book, See You Soon. It was a crossover period with Chris who was moving to New York to join Aperture, and I was left in that limbo of managing Chris Boot Limited but under the contract we were not allowed to do new books, so I missed making books for other people and so I published this book of my own. Aron: Why didn’t you give it to Chris Boot? Or other publishers? Maxwell: The project was a very personal project and I knew it was something Chris wouldn’t want to publish anyway. Hannah: That’s how all people start. You know that nobody wants to do it, so you do it. That’s how Gigi [Gigi Giannuzzi, Trolley Books] did it for Nan Goldin because no one else wanted to do it. Damien: Thriving from refusal, you have to do it yourself and even more so than DIY is the status quo that gets you to do it using all the tools available in that particular time period. Hannah: Yes, why not? Why can’t I do it? I know how to do it. Maxwell: If you take on Offprint from 30 to 300, I’m not sure more people are doing it, more people are given the platforms and can go public with it but I’m sure a lot of people are still making zines in their living room. Hannah: This comes back to Bruno [Self Published Be Happy]... When I started to work with Trolley Books, it was really depressing. There was no features, everyone was going digital, you just had a handful of publications. That’s when Michael Mack was still at Steidl, Chris at Chris Boot, and it was only when Bruno built his self-publishing platform that we all went that way. Aron: Do you think he recognised there was something to do as such? Hannah: Yes, this was after the financial crash, and he recognised there was something to do with it. It wasn’t commercial. Damien: No, it wasn’t driven by the need of change, and people weren’t working, there were no normal jobs anymore. So designers and in short creatives started to do their own things. Maxwell: It’s interesting that this coincided with the 70s popularity of the Japanese provoc. That was around the same time, and it might have been as such, a form of resonance in practice. Aron: In the early 2000s, when I saw young photographers working, they were more keen on doing shows, than doing little booklets. For instance, Vyner Street had 20 small galleries and people were trying to make prints and all of a sudden you had people like me trying to do zines and books, when they felt it was validating for them to do little pop-up shows instead. Aron: Forty people would see it! Hannah: With much less money, you can do something with a zine - much cooler than doing an exhibition. It’s just how the whole thing works, and it’s not just specific to photography, you can be a painter and do the same thing. Maxwell: One of the things that got me interested in zines, was this thing called the Greenwich Pirate*, this must have been about fifteen years ago, and that was a mix of photography, poetry and drawings. Aron: There was a huge surge, there was this whole thing in Shoreditch with zines mixed with fashion always, it was photography and young scenes mingled in that geographic era; and people printing out zines and giving them up for free, Vice was huge at that sort of time. Hannah: Exhibitions will cost you a lot of money to print, to frame, to promote… When the whole zine thing was really low-fi. Aron: I have to say one thing that influenced me was that publisher in Switzerland, Nieves. They were just doing really simple photocopies, beautifully made - making use of simple machines but great content - and also reaching out to retailers across the world - zines by Linus Bill to Larry Clark via Nick Haymes and Kim Gordon - I think they might have recently done an Elizabeth Peyton one too. And they had Larry Clark. Every time I see them, I’m like: “You basically started it”. Another influence was Jürgen Teller, the Master Book, where he just simplified everything and made a really small book. I bought one at his exhibition on Modern Art in Vyner Street. It was digitally printed, it wasn’t printed. Aron: … Gigi had that punk ethos. Damien: Yes, because he was punk, I thought it was possible. He was a maverick. Especially his events were incredible, he created a scene. And for me when you talk about Japan, Japan and London have the same similarities, there are no galleries in Japan, and so you’re making books, and in London, there were no galleries for photography, so to make books was even more relevant, and that’s why it started in a big way here because if you go to Paris or Berlin, there are galleries, it’s structured. Bruno: There was a general feeling that things weren’t going right. And so I went to New York, I got acquainted with the Printing Matter world, which seems to overlap with the photo world, but actually isn’t the same, they come from the traditional artist books; and the photo book has a separate history, but the artbook had a renaissance in publishing, the fair was growing. At the time it was still in Chelsea, not yet at PS1, with a sense of over-boarding, and so I had a sense that something was going on… When I returned to London, I put up a call for submissions, which had 300 responses, and you, Maxwell, were in the first show? Maxwell: Yes, you had curated thirty artists to be exhibited at the Photographers’ Gallery in 2011. Bruno: Yes, and that was done by a call of submissions through friends. I don’t even know who? Hannah: Who are your friends? Bruno: People I was in touch with through Chris Boot, selfpublishedbehappy.com and LLC [Where Bruno was teaching]. Aron: Do you think you could curate thirty books today or do you think there is too much content to do something that small in numbers today? Bruno: Yes, I was still waiting for the limo outside my house which never showed up. Hannah: Tell us about Gucci. Jesus! Bruno: So anyway, there was the founder of Nero Magazine which was started around 2006 and basically lasted for ten years, and then they made it into a publishing house, and there was flash art, which basically is Italian royalty in terms of publication, etc. And I was talking with a curator who was saying that it was interesting that all these things always had a beginning and an end, as to say, you can map out when something explodes and then progressively fades away. And they were praising the idea that something had a heatwave and then would end somehow in a physiological sense. And I think that self-publishing certainly and also publishing in a way has that cycle. It has happened so many times before in publishing. Another causality is about energy, I think it was David Senior, former curator at MoMA who made that point in one of my interviews, he said: “How long can one actually push things forward, not making enough money?”, and so that generation who pushed self-publishing ahead might simply be exhausted, and so they move to something else… Like Damien who could buy a house and has now a mortgage. Damien: Yes, but that wasn’t done with books. Aron: … and actually the increase in independent publishers at Offprint aren't paralleled by an increase in bookshops, we potentially got the same niche market. And as much as this is happening, Mörel is always trying to evolve, I’m actually going back to do zines because it’s less work. Aron: Yes back to basics. And even the way I fund things, I have always gone against the waves, I don’t publish a book through retailers, I do special editions. I now try to get more funding, and what Damien was saying about Britain’s publishing because of a lack of space, but we also lack any sort of public funding and we lack philanthropy from Brits. In France, they have public funding, the Swiss and the German do, we are the ones who are sort of… left out in the cold, and we don’t have collectors either. The three people I could think of who put money into books are all Americans who come to London and actually engage in that whole independent publishing society. Actually one American gave money to university for bookcases. And it says about this cultural lack of philanthropy in Britain. Damien: I actually didn’t mind that because you know, I’m French, and that was the reason why I was in England. Because you are on the edge, if you lose a job you have nothing, if you’re in France or other European countries you pay taxes, but if you lose your jobs you have monthly subsidies to stay on your feet, but here I liked the danger and to be out of your comfort zone forces you to be creative / inventive. It’s dynamic, this is why New York is so dynamic and London to a certain extent. Because here we have no choice and that discomfort is really interesting for creativity. I really like it. Aron: Let’s all vote for Tories for creativity. Maybe, there was a bigger plan behind Brexit. Damien: Actually, bad politics is good for creativity, look at the outburst of creativity in the wake of the US elections. Bruno: I don’t know if that’s true. Yes artists are doing their things, there are collectives, but I cannot think of American small publishers. Aron: I don’t think people can risk it there, here you can risk it and still be on tax credits I suppose. You can still somehow get by. Hustler works for Karma while he’s publishing his own stuff. CB: What’s the next city then? Bruno: Berlin is nothing. I don’t know what’s going on in France? Damien: France is doing fine. Spain exploded in the last years, there is a lot of publishing coming out from Spain, essentially as the result of the economic crisis which was huge, so people invent a system, invent a job and by doing this, it’s a way to be active; really I think that creativity is flourishing in times of crisis. Aron: What about Japan? What is happening there? You said they have a very strong niche market. Damien: I believe the Japanese were very insular and now they are more open to the world and to what is happening in other countries. They are aware of the big interest of Europeans for Japanese publishing and they are really creating these links now. Before you were used to seeing nothing coming out of Japan, and now there’s a lot. Aron: I’d like to see something coming out of Russia. I don’t know, have you guys seen any work coming out of there? Bruno: The problem there is the lack of freedom to do something like that, the censorship is a real problem both in printing and distributing. Same thing in China. I’m actually going to Shanghai for a week and for the art fair, and I’m really curious about the publishing context there. CB: Let’s talk about how Hannah transitioned from Gigi to becoming Hannah? Aron: I said the other day, that Gigi was doing his own thing and it was very political and when you came along you transformed it and made it very young and very female and very interesting, just with the two artists you represent and are currently showing now, Maisie Cousin and Juno Calypso, you have spearheaded that movement. It sounds horrible to say that on Gigi’s chair but to a certain degree what you’ve done is to give it a fresh new life; you made it very contemporary and very relevant. Damien: Yes, it was a big task to take over from Gigi, his presence was huge. Bruno: And you went from publishing to a gallery. Hannah: When I started with Gigi, I kind of helped develop the gallery and then we had divided things as Gigi would do more books and I would do spend more time at galleries, but the two of us would always cross over, and Gigi was amazing when going to artists’ studios and talking them into the work anyway, so it wasn’t that defined, it was a loose idea. And then, after he died, I knew that I had to carry on what he did at Trolley anyway, so then it just became this symbiosis between publishing and showing, and that also came around the time I was going to book fairs. When he died the first fair I went to in New York was in 2013. And we wouldn’t do the fairs so much when he was alive. He just missed that or it was just starting, his background was more the Frankfurt Book Fair, when Trolley started that was the only fair that existed. And he didn’t want to pay for the stand then but he would have loved the fairs. Bruno: When Offprint arrived here in 2015, New York and Paris had already an established scene for fairs. Even though Paris had been always conservative and still is. New York always was the wild one. And in a sense, London sat in between the two. And that was the mandate from Simon Baker to bring some elements of programming. Aron: Do you think that there is a certain desire, and I certainly had it for Mörel Books, do you think that’s how subculture works as to be part of the mainstream? I constantly nag the MoMA or push The Guardian. I like what Simon did in bringing Offprint into the Tate. Have you guys ever had that desire to have our stuff flirt sort of more with the broadsheets… or more sort of globally mainstream? Aron: But if you think of Julien Aschner who used to do the magazines at the Tate, and secretly snuck in a zine section. And it was very successful. So as much as the books can exist in certain spaces, I think if you gave it to the new audiences in new places and you work intelligently, it could have impact. And once again, it’s the Tate that has done it twice with Julien Aschner and Simon Baker; both of them having enemies within it. Maxwell: There is also Mohara Gill at Foyles on Charing Cross Road. I would never have imagined having books at Foyles because it’s Foyles but she created that space for it, which is really cool. Hannah: … if we could sell thousands of books we would but we just know that we can’t. When Gigi started making books, having come from a big art book publishers – Allemandi and Rizzoli, 5,000 was not a lot of books, 10,000 was not a lot of books. So basically the market shrank and shrank and shrank… And all of the Trolley books Gigi was publishing were printed in 3, 4 or 5,000 copies, because that was the model, and he didn’t realize at the time because he was being very idealistic, he really thought that the people are going to buy these books about difficult subjects, and they didn’t. Then that crossed over… when the people started to do the zines, it was all about small numbers, and so Trolley started by making thousands of copies, to now where I don’t think I publish more than 1,500 copies of a book. Bruno: I think that Steidl and Michael Mack, and Aperture of course, are the ones who got closer to really moving stock into the mainstream. Partly it’s because of the nature of the books themselves, because you know, how many people are going to engage with Anthony Cairns’s book? Aron: [Feathers ruffled] What do you mean, thousands! CB: Could independent publishers be bought out by major companies, not necessarily tech giants but publishing houses? Aron: You know what? That actually happens a lot to small literary agents who get bought by Penguin Group and others. And they keep some sort of independence. Damien: In music, it’s the same. The majors buy the indie labels and feed them with financial and distribution support. Aron: Hopefully we’re still all on the sofa. Bruno: Hopefully we will still fit on the sofa. Bruno: I’m talking for myself. But you know, I think we should also facilitate a new generation. There are a lot of young people with ideas. Hannah: Do you think we will still be doing books? That’s still going to be the thing? Bruno: mmmm…. It’s a good question. At least my students don’t seem to be willing to stop. Damien: Books will still be around, but personally I don’t plan. I don’t like planning years ahead. I just do work by project like I started. I started it like a project and it should be like this; it’s just more exciting, you know. Hannah: Yes, there is no five-year planning in publishing. CB: What about the sustainability of it? Bruno: But maybe, sustainable publishers won’t be able to do things only by project. Bruno: [interrupting]: It doesn’t matter, even if the plan is to have a millionaire given you a million every year, that’s still a plan. It doesn’t matter where the money is coming from, but it has to work financially. Aperture, Michael Mack, maybe Patrick Frey, they must have a structure to this. Aron: For Patrick Fray, it’s a lot of hobby with a lot of money behind it. Bruno: It doesn’t matter, there are restaurants who are running in the same manner. Facebook is losing money, it doesn’t mean they have no business plan; they might simply be set for a loss. Maxwell: Sometimes you’re funding your publishing practice with other things on a side. Damien, you have your own design as your source of revenues. Damien: Also, money is not necessarily all of it. For me publishing is also building a presence. It means to be invited and to exist in the network of photography; participate in jury and awards, teaching and all sorts of things. Bruno could teach at ECAL in Switzerland, it only happened because you were brave enough to set up a publishing company. I don’t see it as an end goal but rather as a way in to do other things, and all things go together, so it’s merging. CB: Bruno, what have you learnt from your experience in teaching in different institutions and different countries? What are the trends? What do the young photographers look for? Bruno: First of all I teach a lot of Masters students who are grown up and that makes a difference. And it great to see that they are smart and realistic about what publishing and photography can lead to. They are not naïve. They are actually pragmatic, they are actually mature in their way of thinking how to subsidize their photography with other forms of income. I don’t come across people entering the world of photography with the wish to become a publisher for instance. Hannah: On the reverse, I do meet a lot of photographers who think: “Oh I’m going to make a book”, and that has to change a bit as too many photographers think it’s a given to make a book. Laura: … And I was speaking to a curator about why they take on an artist in their gallery – whether it is a commercial gallery or not, and the answer was: when somebody publishes a book, it makes them more sellable. Do you think that’s why people are shooting on books, and do you think that’s the answer? And why do you think that trend exists? Aron: Strangely enough, I’m doing a book with an artist that’s shooting up quite big, and his gallery wants to stamp their name all over my book and make it like a catalogue; and it’s quite a major gallery. And there is an importance in separating it and having independent publishers acknowledge the artist’s work. Laura: Do you think it’s a stepping stone, in order to get a gallery. You need a book and in order to get a book you need a gallery? Damien: It does. It’s part of the big trends. Now it’s almost like a statement to have a book, so people have incorporated books into the mainstream. Hannah: A lot of galleries work with a publisher so that they have the book. And it’s in their interest because it’s a collectable. It is like a catalogue because you can see the work; it gives some credibility to the author; chance for text… etc. Damien: We have to say it, so many times a photographer publishes a book and then a gallery takes her/him on. To me that is sort of the greatest accomplishment… by publishing a book, the artist gets a sort of cultural presence, as much as to break even. Bruno: I don’t think artists are so cynical about this, at least they don’t tell me. Maxwell: I know photographers for whom the book is the stepping stone in their career, it definitely is. Bruno: But one is not versus the other, you don’t have to be cynical about it, it can be a stepping stone, but one can say: an exhibition is a stepping stone in a cynical way to make money. First of all, it’s a bad way to make money, and the second thing is, the book is also a bad way to lead to, lead to what? I can’t believe that there is not a fire there. Hannah: But without being too big headed, I think that what we have established within our brands or publishing companies, I believe we have a sort of… people do listen to what we’re saying and doing. I think curators and editors do, and we are all editors, we are editors of content and we bring it up to the public. Yes, that’s why that show that you have curated Publish/Curate, and I invited you to have the exhibition here because you as publishers, you are the new curators because you launch people’s work. You can of course self-publish and a lot of photographers blindly say they want a book, and they’ve got no inclination about what that means. Damien: I think this is exactly the point. A publishing is a curation. You could self publish and do it by yourself but being part of a publisher is also being part of a pool of artists. Aron: You know I think a lot of people who might not tend to go to commercial galleries, tend to go to institutions and major museums. In spring, we did an ICP LAB at the Bowery and my main vision when we created the three islands [An Archipelago of Three Islands], is basically to allow the public to engage properly with the artist; when a lot of institutions do have a wall. And as I said it earlier, I always had a desire for Mörel Books to flirt with the major institutions and major newspapers, I have always nagged editors, and I used to do that thing at Blacks to gather people and get the books into the MoMA Bookshop and I think they are not out of touch to the general public. As British we might act as smaller independent publishers, but we are also related to a lot of these people and institutions. Damien: I agree, I praise institutions that take the books, because they have them in display for public consultation, for free, and that is amazing. Maxwell: At the Bound Art Book Fair at the Whitworth in Manchester, it was so nice to be at that book fair as most of the people who were coming through there said: “Oh, we just came for a day out at the museum”, and they stumbled in the book fair and they were looking at books and buying books. And these are the people I wouldn’t reach in my regular outlet and network in photography. Hannah: I agree. I always go to Manchester as much as I can. I went to the Whitworth and you get so much more attention there from all the curators of the North of England, and all the collectors there, it was quite refreshing. There was so much interest in what was happening there. Damien: Yes, to be able to access institutions’ libraries and be allowed to look at all the books is amazing. Aron: I don’t know if it is just me getting old and being an old fart saying that [Aron just turned 40], but I do think that a lot of the younger generation has this idea to do books and haven’t gone to libraries. My own interest in books started with me having access to a library, being interested in it, researching in it. Basically all of my books are photocopies of other books. Aron: I wouldn’t even call myself a collector. I was fascinated by photography and by the book, and its availability; the book’s potential to disseminate information and be collectable. And I think a lot of young people are interested in the book form without having researched, and collected, and built a bigger consciousness about what a book is. Hannah: Yes, they haven’t gone through the whole trajectory of it. Laura: But then again, to see the book as a stepping stone, do you see that as a positive or a negative thing? Aron: With photography… I think books and photography live beautifully together so if they are thinking their work in that medium, it is relevant. Hannah: It requires thought to understand what the book is, if not it is a very superficial thing. Bruno: Who’s going to buy that book anyway? It’s not going to work. Hannah: … and see other books. CB: But if we draw a parallel to the music industry and the live events, you always needed an album, a music demo, something curated to present your work. Aron: Yes, Bruce… Oops Bruno [General laughter]. In the first and second years of Offprint in London with SPBH - the smoking book with Melinda Gibson, the selfie aerobic etc. The ‘Play With Me’ installation… Book fairs can be really drab - like standing in a big shopping mall with just the background buzz of people chatter - but what Bruno created there was a sort of swirl… It was bonkers, playful and informative. We have to entertain ourselves you know. Bruno: Can I say something that might be slightly controversial here? In the last three years, one thing that changed for me is the distribution. And having a major distributor has allow me to push books around. Bruno: D.A.P. Suddenly now I can move a thousand copies of books, let’s not talk about the economics of it, but you actually move stock. While in the States, it was just a handful of them in New York. If you have books in New York; you know, if you are lucky. And a big part of the problem is that there aren’t many bookstores. Bruno: Exactly, exactly! But you know America is big. And in Europe I’m still sort of struggling because there are roughly 10 bookstores that regularly order books, and I don’t quite understand if there is a market outside of those 10 outlets or…? Bruno: But it doesn’t, because it’s a physical enterprise which means moving an object from one place to another. Aron: What about revolving around social media and connecting directly with our buyers? Bruno: Look, do you want me to tell you? Because this is a kind of given in the industry, the people that are following on Instagram, they don’t buy merchandise. Aron: I’m not saying from Instagram but from our newsletter, from our fair presence, we generate massive audiences. Aron: Oh, yeah? But if we’re keeping it down to 1,000 / 2,000 books, I have to admit I have sold out smaller editions without distributing copies to the shops, and they sell out online in a couple of hours. Bruno: You mean, you sell them to your people? Aron: Yes. And these are the books I could have sold via D.A.P. and it be incredibly successful but I say F…K D.A.P., I’d rather sell them directly. Bruno: Think about it! You want to be mainstream? Instead of printing a thousand, print 5,000, give 4,000 to D.A.P. and sell a thousand to your friends online. Aron: I didn’t mean that mainstream! Bruno: [Impatient] Doesn’t matter D.A.P., I’m not praising D.A.P. Hannah: I believe a book that sells will sell no matter what, and I don’t see which shop D.A.P. is reaching out to that you cannot reach on social media. Which book did you sell via D.A.P.? Hannah: What about the baby one? I want a copy of the baby one [My Birth by Carmen Winant]. CB: Who do you see sitting on that sofa in three years? Aron: He’s tall. He fits a little better on the sofa, and probably could touch the ground. Maxwell: Lewis and Sarah [Loose Joints, founded in 2015 by Lewis Chaplin and Sarah Piegay Espenon] were a progression of 14/19. Their attitude now is to be a traditional publisher to where we came from. Damien: Each new title coming up… I like what they publish every time. Aron: I also love the energy and the duo of Akina, Valentina and Alex [Valentina Abenavoli and Alex Bocchetto]. Even if I’m not crazy about all that they publish, they do quite wild and interesting books and their approach to it is interesting. They are reaching out to markets in Kathmandu. And the main energy in Akina is a woman, Valentina. Bruno: And so it is for Sarah and Lewis. They are two people. Aron: Lewis is just a smiling front. In three years? Who will be there making new ground? Will there be someone doing this? Will the whole thing prove to be a fad and the circus not only leave town but close down? Maybe it’s not about European pursuers but the scene coming out of China, Russia, Thailand, Africa or South America? Maybe it’s using new technologies? Three years goes in a blink - but so much can change… If we look at kids doing things now, I’d like to suggest following the book fairs happening in the Far East, that's the new ‘mecca’; that's why Damien is in Korea, Bruno in Shanghai and why I’m desperate to get out to China, India and Iran. Yeah, there’s a book fair in Iran… How curious I am! Bruno Ceschel, founder of SPBH Editions. Bruno Ceschel is a writer, curator and lecturer. He established Self Publish, Be Happy (SPBH) in 2010 to promote a new generation of photographers and self-publishers, after noticing the ground-breaking DIY photography books and zines which young artists were, themselves, producing. SPBH published its first book titled SPBN – Self Publish, Be Naughty in October 2011, and has since organized events at The Photographers' Gallery, ICA and Whitechapel Gallery in London, OffPrint in Paris, at Flash Forward Festival in Toronto, and at C/O in Berlin. Hannah Watson, director of TJ Boulting Gallery and Trolley Books. In 2005, Hannah Watson went into partnership with Gigi Giannuzzi, the legendary founder of Trolley Books, an imprint that became known for working with undiscovered photographers on their first books and turning the likes of Paolo Pellegrin, Alex Majoli and Adam Broomberg into celebrated names. Giants in photojournalism such as Philip Jones Griffiths also found a home at Trolley. In 2011, Trolley opened a new office and gallery in Fitzrovia, TJ Boulting, which hosts contemporary art and showcases artists who have not exhibited in London before. Maxwell Anderson, photographer, founder of Bemojake. Maxwell Anderson is a photographer who started Bemojake in 2011, publishing limited edition books in close collaboration with the artist and designer. 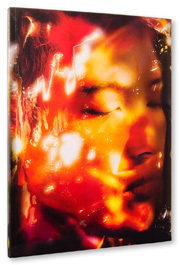 The imprint combines his love of photography and the work of others. He published his own work in his first book, See You Soon [Out Of Print], while his latest publication is The New Colonists by Monica Alcazar-Duarte. “I find working with a photographer and making a book with them is another way of expressing myself,” he said. Aron Mörel, founder of Mörel Books. 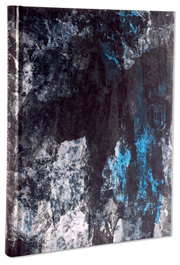 Aron Mörel established Mörel Books, which specializes in affordable limited edition art books, in 2008. He has published both emerging and established artists including Lucas Blalock, Alix Marie, Antony Cairns, Corinne Day, Boris Mikhailov, Thomas Ruff, and Patti Smith. Viewing the book as the final step in an artist’s work, independent publisher, Mörel seeks to work closely with artists in bespoke collaborations. Damien Poulain, founder and creative director of oodee. Damien Poulain is a graphic artist and illustrator, who established independent publishing house oodee in 2011. Through its POV Female series, oodee promotes the work of young female photographers around the world. 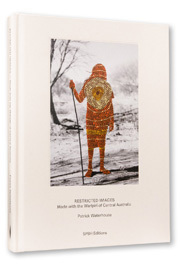 It has also published the work of photographers such as Pieter Hugo, Charlotte Dumas, Viviane Sassen and Roger Ballen. London Calling! The British Journal of Photography hand-picks five publishers that shape the indie publishing scene in Offprint 2015 for its magazine.